An engineer working on the first section of the Channel Tunnel Rail Link at Folkestone has been electrocuted. The man died as a result of the incident which happened on Friday at about 1940 GMT. The man, who was a sub-contractor and has not been named, is thought to have come close to a live overhead wire near Westernhanger. It is the first death since work began on the link from the Channel Tunnel to North Kent in 1998. Testing of the link was suspended for the weekend pending an internal investigation by Union Railways South, the company responsible for building part one of the link. The Health and Safety Executive has also launched an inquiry into the death. A spokesman for Union Railways South said it was a "tragedy". The power system that will carry trains on the rail link was switched on for the first time in February. Overhead wires along the first 46-mile section of the railway carry 25,000 volts of electricity. 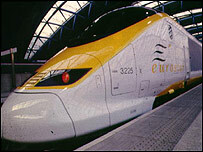 The link is due to open in September and the testing of the Eurostar trains on the line is due to start in about three to four weeks.